Mike Nicol is a journalist and writer, and teacher of online writing courses on creative writing and non-fiction narrative. He lives in Cape Town. He has had writer-in-residence positions at UCT and the University of Essen, Germany, and in Berlin under the German Academic Exchange Service’s Artists-in-Berlin grant. His crime novels are published by Umuzi in South Africa, Old Street in the UK, btb Verlag in Germany, Seuil Policiers and Ombres Noires in France, and De Geus in Holland. They have all featured in the KrimiZeit top 10 list in Germany, and Payback was shortlisted for the VN Thriller of the Year award in Holland (2015) and the Prix SNCF Du Polar 2016 in France. Out to Score appeared in the US in November 2009 retitled Cape Greed and under the pseudonym, Sam Cole. Mike Nicol has given workshops on writing crime fiction at the University of Cape Town’s Summer School, Bloody Book Week in Johannesburg, the Franschhoek Literary Festival, the Hermanus Fynarts Festival and the Knysna Literary Festival. He tutors online short courses in creative writing and non-fiction narrative writing through the PenguinRandomHouse/GetSmarter website. Together with editor Claire Strombeck he runs the highly successful The Writer’s Masterclass – now in its sixth year. Among the writers from the class who have published books are Qarnita Loxton, Jennifer Friedmann, Maria Phalime, Martina Dahlmanns and Melissa Volker. To contact please inbox through Mike Nicol’s Facebook page. For crime fiction news and interviews go to Crime Beat which is devoted to SA krimis, and more. An ebook version of A Good-Looking Corpse is available on Amazon. 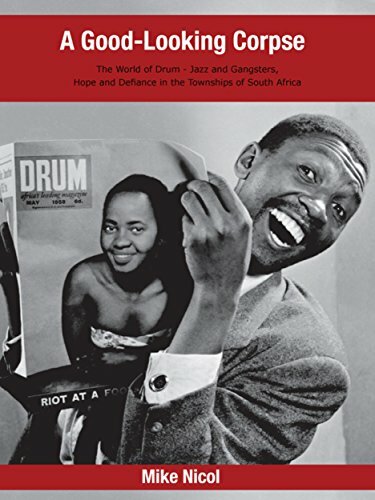 A Good-Looking Corpse, The World of Drum – jazz and gangsters, hope and defiance in the townships of South Africa, 1991. Commissioned by Secker & Warburg, this is a historical tribute to a group of black journalists who worked on Drum magazine in Johannesburg during the 1950s. The book consists of an overarching historical account within which are featured original pieces from the magazine as well as interviews with the journalists and some of the personalities who made that decade a particularly vibrant time in the black townships. The Waiting Country, A South African Witness, 1995. A commissioned memoir of the 1994 first democratic election that also sought to address the issue of violence and the need to confront South Africa’s historical legacy. The Invisible Line – the life and photography of Ken Oosterbroek, 1998. A commissioned short biography of the newspaper photographer who was killed in Tokhoza township shortly before the 1994 election. Sea Mountain, Fire City – Living in Cape Town, 2001. A memoir of a year in Berlin and subsequent return to Cape Town. Nelson Mandela: the Authorised Portrait, 2006. A commissioned forty thousand word biography of Nelson Mandela as part of this book including interviews, photographs and reproductions of historic documents. Mandela – Celebrating the Legacy, 2013. Four biographical essays on major themes in Mandela’s life: leadership, law and justice, education, and democracy and human rights. Monkey Business: The Murder of Anni Dewani – the facts, the fiction, the spin, 2011. A chronological account of events after the murder of tourist Anni Dewani while on honeymoon in Cape Town as told by the media.